As director of the Newmarket Heritage Festival, I coordinate all aspects of this annual weekend of arts and music, working closely with a small team of volunteers. Along with hiring the performers, artisans, and other participants, I oversee fundraising and handle publicity. The job involves a good deal of writing—from fundraising letters and website content to press releases and grant applications and reports. A few samples are included below. Visit the festival website to learn about the Newmarket Heritage Festival, the Seacoast’s favorite international block party. Thanks to you, the 13th annual Heritage Festival was a huge success—a vibrant celebration of the arts, culture, history, and community spirit! We couldn’t have thrown such a successful international block party without the support of our wonderful sponsors. Thank you! 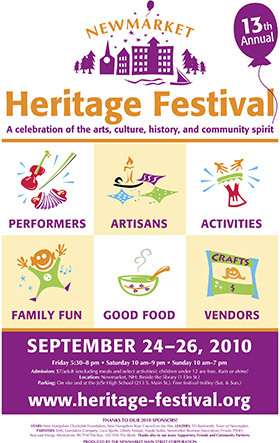 And now we’re looking ahead to the 14th annual festival, scheduled for September 24 & 25, 2011. We’re hoping you’ll join us again as a sponsor of this special regional event, which draws people from throughout the Seacoast and beyond. Last year’s festival featured a wonderful line-up of multicultural performances, including the African drumming and dancing of the Akwaaba Dance Ensemble, the sounds of Scotland with the Webster Family, and the spinning diabolos and traditional choreography of the Chinese Folk Art Workshop. Also taking the stage were the soul-inspiring Voices from the Heart, the lively Opa’s Oompah Band, and the ever-popular accordion warrior, Gary Sredzienski. There were Irish and Indian dance performances, strolling barbershop quartets, and a rollicking Saturday night dance party with the Jumbo Circus Peanuts. Other festival highlights included artisans at work, kayaking on the river, a model railway, an antique car exhibit, history walks, dozens of vendors, and a host of try-it-yourself traditional arts for both children and adults. The ongoing support of our sponsors is what helps to ensure that this special celebration continues to thrive. Over the past decade the festival has brought more than $150,000 worth of multicultural programming right to our doorstep here on the New Hampshire Seacoast. But admission fees cover only about 25 percent of the cost of producing the festival. We need your support now, more than ever, as we continue our efforts to keep this popular event affordable—while still managing to meet the growing expenses that accompany a high-quality production. . . . The Newmarket Heritage Festival honors the rich diversity of tradition, past and present, that defines this small New England mill town and the Piscataqua region. Through the years, the traditional art forms of many cultures have been featured at the festival, including Polish, French, Irish, German, Laotian, African-American, Chinese, Indian, and traditional American cultures. The event has grown from a one-tent festival to a full weekend of multi-cultural music and dance performances, artisans at work, participatory workshops and demonstrations, hands-on children’s activities, a busy waterfront venue, fine arts and craft vendors, delicious food, and lots more. Organized by a small group of volunteers, the festival has gained a reputation for its eclectic mix of entertainment and activities, as well as for its friendly atmosphere. We hope you enjoy this lively celebration, which takes place in the shadow of Newmarket’s historic mills, where so many once labored so hard–-and where a sense of community continues to thrive. The festival’s Main Tent and adjacent Workshop Tent showcase outstanding local and regional performers, sharing the sounds of multicultural traditions old and new. The smaller Workshop Tent is a second stage for intimate, up-close performances and demonstrations where audiences learn and participate in traditions that have been passed on through the generations. The weekend begins Saturday morning at 10 am and continues until Sunday at 7 pm. New this year: Trash Can Lid Productions, a band with an environmental twist—they make music on recycled instruments; the harmonies of the Bel-Airs Doo-Wop group singing “the best of songs from the best of times”; a Dueling Dulcimers performance on the mountain and hammered dulcimers; a lively Israeli dancing workshop; high-energy African drum circles with percussionist and teacher Carl Nickerson; and Gary Sredzienski’s popular serf rock band, the Serfs, which closes the festival on Sunday afternoon. Returning favorites: extreme juggling antics with the nationally-acclaimed duo, Two; a dazzling diabolo demonstration, dragon dance, and more by the Chinese Folk Art Workshop Troupe; the foot-tapping Bavarian tunes of Opa’s Oompah Band; a dance party with the Jumbo Circus Peanuts, who will rock the main tent during the Saturday night Soup and Chowder Fest; the stunning beauty of traditional Indian Dancers; the rhythmic spectacle of the Japanese Taiko Drummers; a high-energy Bollywood dance workshop; Newmarket’s own father-and-son fiddling duo, Ryan and Brennish Thomson, playing world music; and ever-popular accordion man, Gary Sredzienski playing the music of Eastern Europe and more. This year’s Artisan Tent, funded in part by the New Hampshire State Council on the Arts, includes artisans who love sharing their passion for the past: blacksmith Garry Kalajian, cooper Ron Raiselis; dulcimer maker Alan Batchelder; wildfowl carver Fred Dolan, and 18th-century printer R.P. Hale, who will be creating the seventh in a series of prints of historic buildings. The adjacent Children’s Tent features try-it-yourself traditions for all ages: Chinese brush painting, pottery, letter-press printing, magnet fun, spinning, weaving, woodworking, and a host of traditional tools to try. The festival is packed with activities in each of its three venues: the Main Festival Venue, the Waterfront and Downtown. (Some require a small fee.) Activities include: kayaking on the river and scenic boat rides; a colonial encampment and a model railway; farm animals and giant oxen teams; a bungee bounce and climbing wall; tai chi workshops, sidewalk art, and historic walking tours; a giant ladder truck and a sand sculptor who will create a replica of Newmarket’s historic Community Church. . . . Rooted in the diversity of Newmarket’s past and present, the mission of the Newmarket Heritage Festival is to bring people together for a celebration of the arts, culture, history, and community spirit. The festival is produced by the Newmarket Main Street Corporation (NMSC), a nonprofit group dedicated to strengthening and revitalizing the historic and cultural characteristics of the community and to preserving the legacy of Newmarket for future generations. Appointed by the Newmarket Town Council in 1997, the corporation received nonprofit status in January 1998. Members have been active in promoting the downtown as the center of cultural heritage and history. Activities have included providing assistance on a grant that helped to launch the renovation of Main Street with new sidewalks, lighting, and more; submission of a successful grant for restoration of the historic Newmarket Engine House; input during town-wide charettes on downtown revitalization; and spearheading a 2004 forum about establishing public cultural and arts space in the mills. More recently, the NMSC helped with start-up funding for the Lamprey Arts and Cultural Alliance, a group committed to promoting the arts and culture in the region. The Heritage Festival remains the flagship project of the Main Street Corporation. This highly visible annual event brings people together to enjoy the rich diversity of the arts and culture that defines our past—and our present. Organized by a small group of volunteers who spend all year planning, the festival has gained a reputation for its eclectic mix of entertainment and activities, as well as for its friendly atmosphere. This lively celebration takes place in the shadow of Newmarket’s historic mills, where so many once labored so hard–-and where a sense of community continues to thrive. Main Tent and Workshop Tent Performers: The Main Tent showcases outstanding local and regional performers, sharing the sounds of the past and multicultural traditions that have been passed on through the generations. The adjacent Workshop Tent functions as a second stage and is a place where festival goers are encouraged to participate—to sing, dance, drum, cook, create, and more! This direct experience is one of the hallmarks of the Heritage Festival: these are participatory traditions that can be demonstrated, learned, and enjoyed. Artisan Tent: One of the most popular aspects of the Heritage Festival features artisans at work. For these craftspeople, the past is very much alive and they are eager to share their love of tradition with festival goers. Demonstration Artisans include wildfowl carver Fred Dolan, blacksmith Garry Kalajian and weaver Craig Evans. Printer R.P. Hale will produce the fifth in a series of historic Newmarket buildings on his 18th-century printing press. Kung-Tai Tsay will teach the art of Chinese knot tying in the children’s tent. Other Demonstration Artists: Windsor chairmaker Peter Scheffer, timberframer Tom DeBlauw, violin maker Jim Robinson, letterpress printer Tom Johnson. Other craftsmen featured in the children’s tent offer hands-on learning: letterpress printing with Tom Johnson, woodworking with Alan Mitchell, top turning with Marcel Durette, and traditional tools to try with David Emerson. Festival programming is designed to appeal to audiences of all ages. The growing regional popularity of the Heritage Festival provides the Main Street Corporation with an ever-expanding audience—and an opportunity to instill in visitors and newcomers the sense of community that has always been one of Newmarket’s defining characteristics.